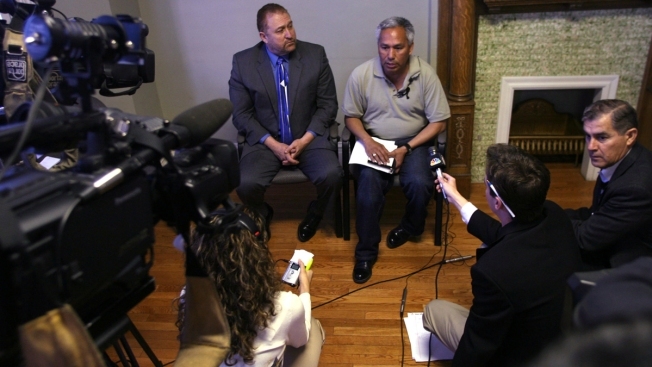 Mexican journalist Emilio Gutierrez Soto, top right, and attorney Carlos Spector, top left, meet with journalists following his release from detention Friday, Jan. 30, 2009 in El Paso, Texas. Gutierrez has been released from an Immigrations and Customs Enforcement detention center after seven months imprisonment. Gutierrez and his 15-year-old son fled to the U.S. border at El Paso after his house was ransacked, and is free as he awaits a ruling on his attempts to be granted asylum. A Mexican journalist has again been ordered deported from the United States despite his fear that his past stories about corruption make him a target in one of the world's most dangerous countries for reporters. The attorney for Emilio Gutierrez Soto and his son, Oscar, said Thursday that he would appeal an immigration judge's decision denying them asylum. Judge Robert Hough's Feb. 28 order says Emilio Gutierrez Soto's testimony was not credible and that he had not shown that he would be singled out for his reporting on the Mexican military were he to return now. Press freedom advocates have highlighted Gutierrez's articles that alleged military forces were robbing and extorting local people in Chihuahua, which borders New Mexico and part of West Texas. He and Oscar Gutierrez Soto entered the U.S. in 2008. Gutierrez says he was threatened for writing those articles and fears he will be targeted if forced to return to Mexico. Hough said that those fears were "merely speculative" given the decade that's passed since the articles were published. The judge also said Mexico "has laws which protect free speech and the government generally respects these rights." Eight journalists were killed in Mexico last year in connection with their reporting work, according to Reporters Without Borders, more than any other country besides Afghanistan. Two journalists in Mexico have already been killed this year. In many parts of the country, drug cartels and organized crime gangs are largely free to harass and murder reporters with impunity. The asylum request made by Gutierrez and his son was first denied in July 2017, and they were taken into detention that December during a check-in with immigration authorities. The two were released in July, two months after an immigration appeals court ordered a new asylum hearing. Their attorney, Eduardo Beckett, said Thursday that the two were not under immediate threat of deportation after the order, but are under a "dark cloud ... which causes much anxiety and stress not knowing the final result." "It is well documented that persons who have filed complaints or have gone public against government authorities have paid with their lives," Beckett said in an email. The National Press Club said it would mobilize in support of the Gutierrez family. Emilio Gutierrez is currently serving a journalism fellowship at the University of Michigan.